JSSC has declared the prelims result of CGL preliminary exam 2016. Candidates who had appeared for the exam can check their performance at the official portal (jssc.in) or else from here. 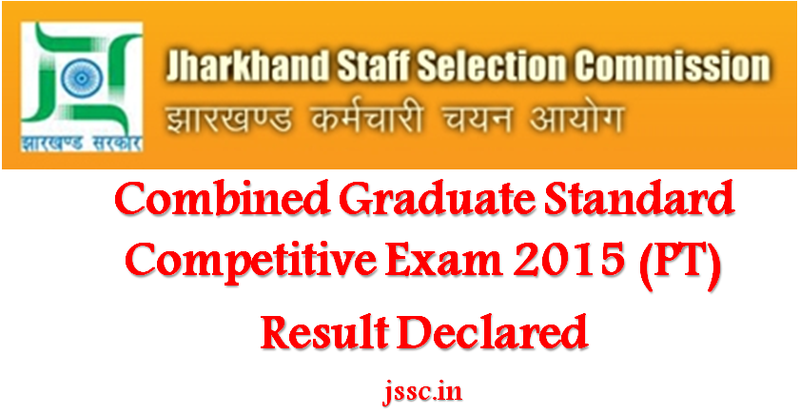 Jharkhand Staff Selection Commission / JSSC has announced the preliminary result for the Combined Graduate Standard Competitive Examination 2015 (PT). The exam was held on 21 August 2016. JSSC CGL prelims exam 2016 was held for selection of eligible candidates against 1150 vacant posts. The examination had received an overwhelming response and thousands of candidates took down the test. Candidates who have qualified in the prelims exam will be eligible to appear for the Main exam. Though exact figure is not known, but as many as 17000 candidates will be shortlisted to appear for Main exam. Candidates who have qualified for the Main exam should take care of few important things. Candidates must be particularly aware of the examination pattern of the JSSC CGL Main exam. JSSC CGL Main exam will be held on 27 November in different exam centres at Ranchi. The main exam will be of two shifts two hours each. More details in this regard can be found from the official portal of JSSC. About Jharkhand Staff Selection Commission: JSSC is involved in conducting examination for appointing candidates to the posts of Group C and Non-gazetted General/Technical/Non-Technical Service/Cadres of the State Government in Group B. The Commission conducts examinations and written tests both at State and departmental levels to absorb candidates into its administrative sectors.